The plates are a bit small for larger pressing needs but capable of handling domestic pressing tasks. The Dulytek DM1005 has a strong durable build and it's a perfect manual heat press for small amounts. If you are interested in producing high quantities then you may consider going for a pneumatic or automatic press but the DM1005 is perfect for home use. It has a rock solid design, completely adjustable, can maintain consistent temperatures, and is extremely easy to use. We highly recommend it for domestic or small business use. Many people are getting into heat press machines today for a wide range of purposes from oil extraction to creating t-shirt designs. 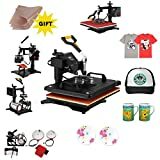 This is mainly because both manual and automatic heat press machines have become smaller, more portable, and easily affordable unlike in the past when presses were exclusively used by large companies. The problem, however, is finding the right machine given the huge variety of models on the market today. If you’re looking for the best manual heat press that will give you great value and productivity, the Dulytek DM1005 Manual Heat Press is your best option. 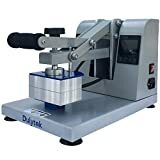 This article provides a detailed review of some of the key features, performance, technical specifications, pros and cons, and other important aspects of the Dulytek DM1005 Manual Heat Press. The DM1005 Manual Heat Press from Dulytek is described by the manufacturer as a manual heat press for rosin oil extraction. It comes with 3-inch by 5-inch dual heat plates and touch screen control panels among other features designed to give you a high yield or output. 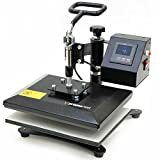 The manual rosin heat press is made for plant oil extraction in small business operations. It is lighter than the previous model, the DM1000, but just as powerful and sturdy as its predecessor. It has a locking mechanism and a conveniently adjustable pressure knob that allows you to exert maximum pressure without the need for continuous physical or manual force. 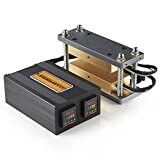 Its dual heat solid plates made of lightweight aluminum provide level heat distribution to give you a consistently high yield. It is designed to provide you with a high yield thanks to its adjustable pressure pressing force of up to a maximum of 1000lbs. It comes with 3-inch by 5-inch aluminum dual heating plates that provide even distribution of heat. Comes with an innovative lever mechanism for locking with maximum pressure without using manual force continuously. It comes with a user manual to help you get started right away. It is delivered in a safe and discreet package. Temperature and timer controls on this manual heat press are conveniently done via a touch screen panel. You can easily set and save your desired press parameters when you are doing multi-batch extractions. Temperature can easily be controlled via the touch screen panel by adjusting it to show either Celsius or Fahrenheit. The Dulytek is quite easy to use and does not require extra accessories or equipment to start your pressing activities. Dulytek did a great job in the overall design and build of the DM1005. 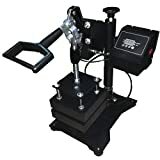 The manual heat press machine is well built for strength and durability. We like the way it stays in place while in operation without shifting position, thanks to strong rubber stoppers at its base. It stays in place despite the incredible 1000lb maximum pressure it delivers. The DM1005 is also easy to move from one location to another. It weighs 30 pounds with a small plate size of 3 by 5 inches. It’s not bulky and won’t eat up much space wherever you place it, whether in your kitchen or countertop. 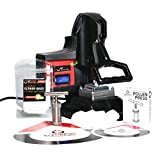 It just measures 15x10x11 inches which makes it a perfect manual heat press for home rosin oil extraction. It is a lightweight, easy to use, affordable, and well-designed press for domestic or small business use. Performance-wise, the DM1005 does indeed provide a high yield with the least efforts, at least for a manual heat press. Its 1000lb pressure, perfectly-sized dual heating plates, touch screen timer, an innovatively designed lever mechanism, and suction cups ensure that you get high yields at all times. The pressure is adjustable too, which is a feature lacking in other manual presses. It is designed to give you a better yield than other more expensive presses. The DM1005 gives you the best performance for a heat press in its price range. It’s, however, made for small jobs given that its plates are just 3×5 inches. Be sure that the plates suit your pressing needs before purchasing the machine. The DM1005 is a lightweight manual heat press that is extremely easy to use, even for novice users. It is a simple press designed for both advanced and beginner users. It features a locking mechanism that allows you to apply maximum pressure with less physical effort for a permanent and clean heat transfer. It is a great option for first-time users.